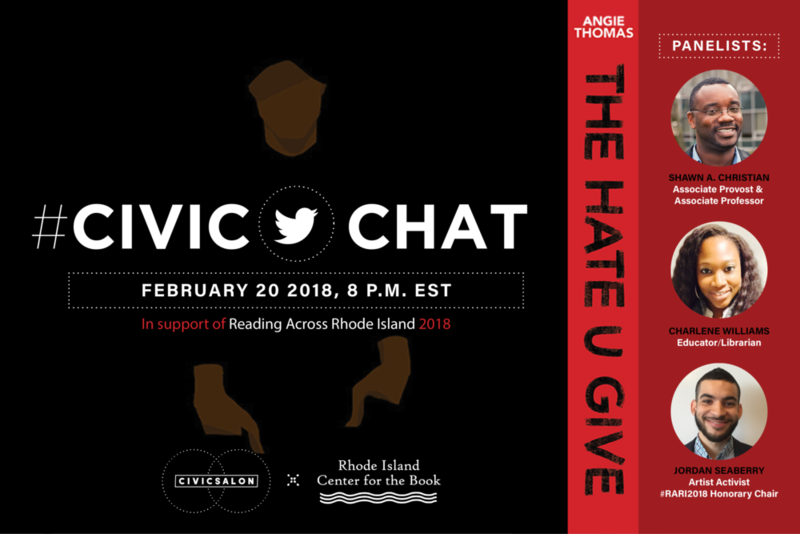 This chat discussion will focus on themes from the book, The Hate U Give written by author Angie C. Thomas (Twitter: @angiecthomas). The Hate U Give (T.H.UG.) by Angie Thomas is Rhode Island Center For The Book's selection for 2018. T.H.U.G is a captivating young adult novel that follows the main character, Starr, a black high school student drawn to activism after she witnesses the police shooting of her unarmed friend. The book takes head on the complex and nuanced topics of race, the relationship between communities and police. Following the 2017 Rhode Island One Book, One State community read of Just Mercy by Bryan Stevenson, this year’s selection continues to elevate the need to both confront and engage in conversation about racism, our justice system and humanity. The HATE U GIVE has received critical acclaim for its raw storytelling and draws in readers of all generations, amplifying the notion of PROXIMITY, something that Rhode Island Center For The Book and CivicSalon both believe in. The hashtags #ProximityRI and #RARI2018 are about encouraging everyone across Rhode Island to read and discuss THE HATE U GIVE; getting Rhode Island readers closer to issues related to racism, dialogue and intentional action and to one another to discussion them. CivicSalon believes in the authority of proximity - that getting close (nearness in space, time, or relationship) to our challenges around diversity, equity, inclusion and justice issues is indeed the cornerstone to both individual and collective change work. During #RARI2018 join in building a sense of community around this book. We encourage you to try on the idea of #ProximityRI by joining our #CivicChats and convening in-person book discussion groups throughout Rhode Island. How well does @AngieCThomas reflect the spirit and feel of the 1990s in #TheHateUGive? What do you make of the ways the characters in #TheHateUGive deal with trauma, Starr’s especially? In a novel about a young black girl, we learn a great deal about black boys and men. Is there a specific message about that relationship that resonates with you? What questions were left unanswered in #TheHateUGive for you? Is there anything you wanted to know more about? Starr’s life functions in two worlds in #TheHateUGive: her neighborhood and where she goes to school. Have you ever been in this type of predicament in your life? TheHateUGive recently won over three Youth Media Awards and was longlisted for the Andrew Carnegie Medals for Excellence in Fiction & Nonfiction medal. What message do you think that sends to the masses? How has #TheHateUGive inspired you to use your voice in your community? How does #TheHateUGive help readers to think more critically about the ways we define ‘family’?